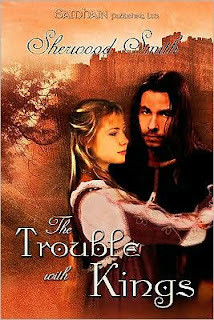 First published in ebook format by Samhain Publishing, The Trouble with Kings was just recently released in print format. I read and loved Crown Duel several years ago and this one caught my eye because it sounded similar in a delightfully swashbuckling sort of way. This book is also being billed as a fantasy romance--a genre I'm beginning to feel is a bit finicky (for me at least). It seems very difficult to strike just the right chord. Flian is a princess. Though when we first meet her she does not recall that rather important fact about herself. She does not, in fact, recall anything about herself as she apparently took a fall off a horse, a bump on the head, and lost her memory. She awakes in an old woman's cabin and is soon whisked off to a castle by her "cousin" Garian. Garian seems very keen to let Flian know she was on her way to see him when she took the fall. Oh, and she was also on her way to her marriage to a dour king named Jason who is also in residence at the castle. Despite the fact that she feels nothing for Jason (and is pretty sure Garian is drugging her drinks) Flian goes along with the plan. That is until another overbearing prince crashes through the window on horseback and whisks her off to a cave in the back of beyond. This prince turns out to be Dour King Jason's brother who is very intent on selling his version of events. Naturally. Eventually Flian manages to remember herself and get home. She even has a loving father and pretty awesome brother waiting for her there. Not that she gets to enjoy them long. Dour King Jason swoops in in the middle of a poetry reading and carries her off once more. Okay. Enough with the plotliness. I had a problem with this book. For one thing, it was very light on the fantasy and even lighter on the romance. I kept waiting for something magical to happen or for there to be some semblance of chemistry between characters (in any sense), but it never came. I really wanted to like it. And parts of it I liked very much. It has a great premise: the amnesiac princess who gets carried off not once but thrice (it's actually even more than that) and has to determine which prince/dour king is lying to her and who to trust, etc. The thing is the abductions got to be too much. And Flian wasn't compelling enough to carry the whole thing off. If she was just so freaking awesome that it was clear why these nutjobs wanted her and you wanted to stick with her and watch her be awesome and figure out which nutjob was actually a cool cat, then that would be one thing. But Flian is just. so. boring. And the princes three? Turns out they're just nutjobs. Pretty creepy ones, in fact. Nothing more. None of the characters get any decent development and when you do find out which one has been telling the truth the whole time (even though he SO has not) he doesn't get any cooler. He's just no longer the one who wants to marry her for her money then kill her. Hardly my idea of The One. Now it did keep me reading all the way through because I kept hoping at some point the story would delve beneath the surface and I'd get to know these perplexing characters in some more profound way. But satisfacton was not in the cards this time. Hmm, is it weird that after reading your review I actually want to read the book? I even checked but unfortunately my local library doesnt have a copy, I'm not sure if I'm curious enough to actually buy my own copy. Again, you're reviews are always fun to read. Hmm, how sad. I read and really liked both the novels in Crown Duel...hmm. Guess I'll pass on this one. Thanks for the review Angie! Kath, not at all! I often find myself quite curious about books that made people want to throw them against the wall. If you do get a hold of a copy, let me know what you think. Thea, it was sad. Particularly because of how much I loved Crown Duel. Oh, well. Hi! I stalked you from The Book Smugglers. I read this book in ebook format and I agree with you, blah. I am surprised to see that it went to print. I read a review somewhere suggesting that her books are high school stories set in a fantasy world, which actually made a lot of sense to me, and set my expectations for her stories. But anyway, yes, I wasn't blown away by this one either. I liked this a lot, but then - while Crown Duel was also my first book of hers - I came to further books via her Inda series with DAW (set 800 years before this time frame in her world) which are classic epic fantasy and lead much deeper into the characters' lives, so maybe you could give her another try and check Inda (which is the name of the first book of that series, too) out of the library. Tiah, hi! All Book Smuggler stalkers are welcome here. And I agree. I was very surprised it went to print. Although, I know she has a strong following so that probably helped. Li, lol. I went to three different high schools and one of them (the tiniest one) was very much like Sweet Valley High. The characters in this book were definitely stereotypical, but pretty rough even for stereotypes, I thought. I just didn't feel invested in any of them. I was so nonplussed with the guy she ended up with, I found myself wishing she'd gone off with the gay guy who was at least a good friend and seemed to actually care for her. Which is more than I can say for....well, you know who. Estara, I will have to try Inda next time I'm feeling like giving her another shot. It sounds more like what I'm looking for. I had the same sort of issues with Crown Duel. I have to admit, I've given up on her.